My friend Lisa is sharing today about her recent experience meeting characters at Epcot and how she was able to accomplish a some of her priorities in a very short time, despite facing some early difficulties. 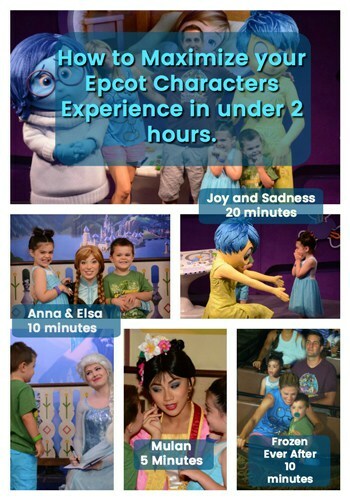 The Epcot characters experience is one that I have, until now, discounted as uneventful. That was until I took full advantage of Character Locator by KennythePirate. Ultimately, Character Locator has transformed my family’s Walt Disney World experience. It has allowed us to maximize our family vacation time while significantly decreasing time we spend waiting in line. 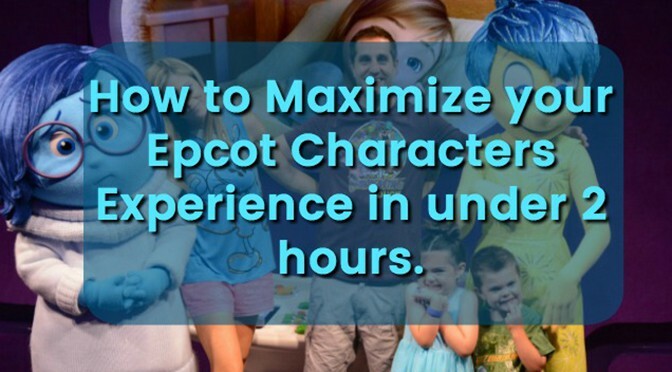 By using Character Locator, my family and I had one of the best Epcot characters experience (in under 2 hours!) on our most recent trip. Visiting Walt Disney World without characters would be just another vacation in an amusement park setting. The characters of Walt Disney World make the magic of Disney come to life. Guests can relive their favorite Disney movie moments by sharing a quote or scene with a character. Never off script, characters make children (and adults!) question reality. The characters truly bring enthusiasm and authenticity to the guest experience. From character training with unique character meet-ups to Anna and Elsa’s new Royal Sommerhus, the Epcot characters are plentiful. Admittedly until I started using Character Locator, I had no idea Epcot characters even existed. However, Character Locator completely revealed a behind the scenes to Epcot that I never knew existed. Tip: Finally when you are face to face with a character do you just hand over your signature book and smile for a photo? Get more out the experience with Character Locator! It has individual tips for interacting with the characters to maximize your character experience. 2) Check the transportation schedule posted on the “Walt Disney World Times Guide” (received when checking into any on-property resort and located at all park entrances). Tip: Crowd calendars are based on historical crowd size over the years (and projections for upcoming crowds); including current events, added entertainment, and seasonality. Keep in mind that parks such as Magic Kingdom close early on select nights September through December for Mickey’s Not So Scary Halloween Party and Mickey’s Very Merry Christmas Party. Choose your park visit days wisely to get the most out of your experience. Criteria one, pass. Criteria two, fail. As it turns out, the day I planned for our family to head to Epcot, via Monorail from the Contemporary Resort, the resort monorail was down until 9:00am. Our family arrived at the Monorail at 8:00am, attempting to get to Epcot for park opening. There’s nothing more satisfying for a planner than to accomplish a hard earned checklist. When plans suddenly change you find yourself tempted to give up the whole day and just walk aimlessly around the parks like everyone else. Well, not this girl! Determination set in to stay the course even if the monorail snafu attempted to shift us elsewhere. After security, we had what I would call a “brisk” walk over to our first Meet & Greet with Joy and Sadness. Since there is no FP+ available I was really hoping to get there by 9:05am, arriving instead at 9:50am when there was already a line formed. Luckily, because I did pay attention to the crowd calendar, choosing a slower Epcot park day, the line wasn’t as long as it should have been for this time in the morning. However, a taste of the epic fail began to creep when everyone was getting a little tired of waiting in lines: Monorail platform, Epcot security and now this. We ate the protein bars I packed for everyone for this exact moment during the monorail wait. Per my schedule, by this time of day, I had planned for mom & dad with coffee, son with banana, and daughter with milk. Consequently, not very joyful. Tip: Joy and Sadness are two of the many unique Epcot characters that only meet in this park. You will not find them (and some others) in other parks. As expected, our time with Joy and Sadness was extraordinary. The kids ran around with Joy touching all the memories and pointing out the different colors. The photopass photographer was great capturing the moment. Joy and Sadness took their time with us and signed our autograph book. The characters literally reset our memories to Joy mode. The cast members working with them were great too! The meet and greet literally put us right back in our happy place. The best part, Starbucks was right outside this meet and greet location. We were back on track in no time. Tip: The character attendants (cast members) work alongside characters. They are there for the general safety of the characters and to keep the line moving efficiently. If you ever have a special request for a particular photo or want a character to know it’s someone’s birthday whisper to the cast member ahead of time. They will usually make sure the character knows about it right away. I found this is especially helpful before my kids begin yelling incoherent excitabilities to the character they are meeting! Once everyone had a Starbucks recharge we found ourselves excited for more. We had a FP+ for The Frozen Ever After Ride (formerly, Maelstrom in Epcot’s Norway pavilion). Yet we had some time before the start of it. As we walked over to the World Showcase I accessed Character Locator to see what time Epcot characters would be out along our walk. I quickly noticed that Anna and Elsa only had a 10-minute wait. Although we had met them before, I really wanted to see their new Royal Sommerhus, and I thought it would be nice for the kids to say hello to them before riding the Frozen ride. After having a lot of fun with Anna & Elsa we came out just in time to meet some Vikings outside. Then we headed over for our Frozen Ever After FP+. You need to look close at the photo of us in the lower right corner of the feature image on this post. As I mentioned, none of us had been on Maelstrom before, so we didn’t know what to expect. It was a mild drop at best but the way the boat bowed forward I wasn’t sure how steep it was going to be. My husband said his thought was “it’s Disney, how crazy could the drop actually be for a Frozen ride?” My thought was ‘brace the boy!’ and my daughter and son, well, their faces are priceless! In the end, we had a great day, finishing a visit with Mulan, who fascinated the kids! She allowed them to rub her Jade pendant for balance and tranquility (I thanked Mulan for that by the way!). Her hair was up in buns like my daughter so they gently touched her hair. They talked about her dragon Mu-Shu and the bravery she possessed in the movie. (aka her real life tale) Don’t snuff the magic out for your kids, please! Mulan was extremely sweet and my daughter now requests to watch the movie all the time because she had such a nice experience with her. This Disney trip marks one year (5 visits equating to 30 park days visited twice a day) that I have been using the Character Locator app. It has given me the confidence to navigate Disney parks successfully. There’s so much one might miss if they simply walk by what appears to be “just a building”. Without the app I am not confident that my family would get as successful and satisfying a Disney park experience. The app offers a comprehensive blueprint of Walt Disney World parks in real time. Don’t let your family miss all the behind the scenes experiences on your next vacation. The Character Locator app, it’s worth the investment! Lisa Thompson an author for MouseClass.com. My Disney trips began in 2013 when my husband and I took our then 22-month-old daughter and 9-month-old son to Walt Disney World for their first visit. Jump ahead to 2016 and we have fifteen Walt Disney World Resort stays equivalent to 75-days and 150-park visits in the last three years. Obsession? I like to think of it as enthusiasm! Hello Kenny can u explain what standby means for Fastpass and how does one get on standby??? Standby is a regular line vs Fastpass line. I love how the paintings of Anna and Elsa in the queue reference art history (as much of Disney does). The paintings above are an interesting take on “Snap the Whip” by Winslow Homer and “Luncheon on the Grass” by Manet. Does the line move quickly for meeting Anna and Elsa?